Most teachers and parents would agree that junior high can be a difficult time for a lot of students. The brain is constantly developing, which makes social, personal and academic transitions challenging. Studies show that dealing with these challenges during this critical time can lead to disengagement and a higher dropout rate during the transition to high school. According to Education Week, between 60-70% of U.S. students become chronically disengaged from school during seventh or eighth grade. Most importantly, the biggest predictor of on-time graduation is if a student is on track during his or her years in middle school. That’s why, with the leadership of teachers and upperclassmen, WHHS is testing a new program called Eagle Buddies. 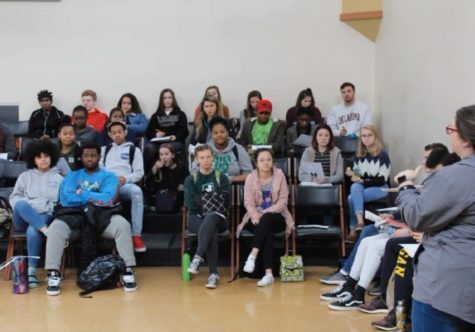 The initiative is a mentorship program between upperclassmen and junior high students; the plan is for each junior high student who wants an upperclassman mentor to option for it at the beginning of the school year, and the counselors will work with the upperclassmen to align the mentor’s and mentee’s study hall together. Girls Who Code club worked with students and administration to help make the pairing efficient and easy. WHHS upperclassmen attend the first meeting for the Eagles Buddies program, which will have an initial test run this school year before a possible broader implementation in 2019-2020. Upperclassmen were able to sign up via a form on schoology, and many responded with the desire to give back to the WHHS community. The program is starting as a pilot in the fourth quarter to help underclassmen end the school year strong and do well on exams. If the program is successful, the advisers will roll out a full program for the entire 2019-2020 school year. The program was made possible through the collaboration of upperclassmen students and administration. One of these students was SENIOR Zuri Williams. Williams worked with Jayma George, Kathy Noland, Joe Stewart and Ashley Thomas-Morgan to help initiate the relationship between upperclassmen and junior high students. She met with a group of seventh graders and asked what they wanted to see from the upperclassmen, and then met with upperclassmen who wanted to create change, and all together they came up with the Eagle Buddies program idea. “It wasn’t that important to me until I talked with the seventh and eighth graders and saw how important this was to them and how much they felt they were struggling and didn’t have anyone to turn to. They were honestly scared of the [upperclassmen] and said they had no relationship with us,” Williams said. Williams says her hopes for the program are to see improvement in school work and grades for the underclassmen, but also for them to learn how to balance sports, social lives and academics. 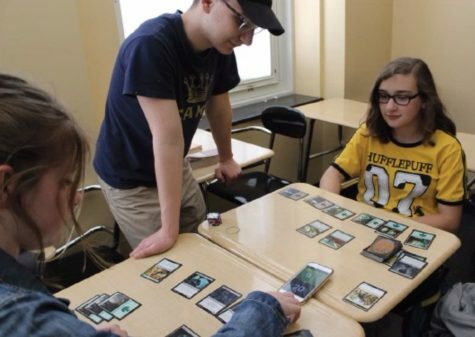 From left to right: Megan Graeler, ‘21, Lincoln Messerly, ‘21 and Sofia Moliterno, ‘23, play a card game after school as a part of the tabletop game club. 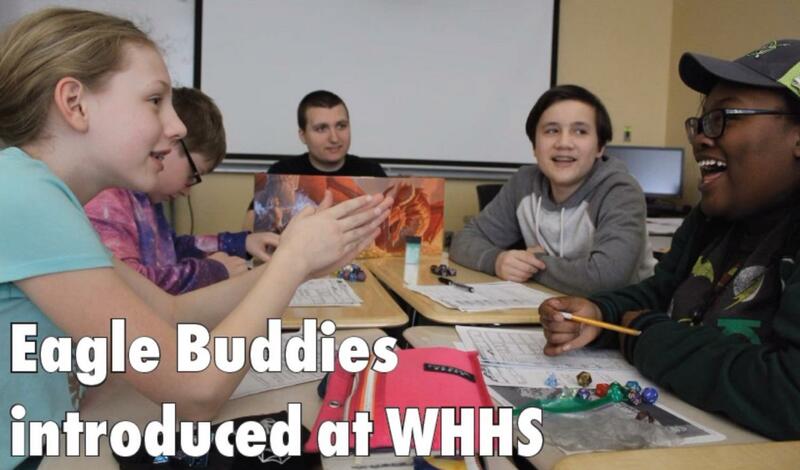 Just like the unique mixing of grades in the tabletop game club, students involved in the Eagle Buddies program will be paired with someone from another grade level who will help them with their academic and social life. The purpose of peer mentoring is not only to mentor, but also become friends with the mentee to ensure a more comfortable experience during their time at WHHS. A true mentor is a friend, coach, supporter and role model. A positive peer mentoring relationship can have strong effects on the mentee’s mental health. Since there isn’t a big age gap between the mentees and mentors, mentees might feel more comfortable explaining issues and concerns to their mentor. It helps them receive more support and and resources through times of struggle. Those invested in the program, including many upperclassmen and teachers, believe it could be a major step forward for the school. The goal is ultimately to help younger students transition to WHHS and have more successful academic careers.